PORT TOWNSEND, WA - Charles Robert “Bob” Fisher, 86, died peacefully in Port Townsend, Wa. on January 1, 2013 after a long illness. Bob was born on June 14, 1926 in Winthrop, Ma. As a child, Bob thought the flags were flying in honor of his birthday. He later learned that the same date is known as Flag Day! Living by the sea, Bob became an avid sailor and competed in many sailboat races. He left home at sixteen, and when WWII began, he entered the Navy V-12 program, training to be a pilot. The war ended before he completed his training, and Bob returned to Case Institute of Technology in Cleveland, Oh. where he earned a degree in administrative engineering. Bob met the love of his life, Joan Ferreri, on a blind date in 1947. They married on June 26, 1948 and began their journey through 64 years of marriage. They raised five children. Bob’s working career started in Cleveland for the American Greeting Card Company. He later met the founder of Saga Corporation and began working for the company, a career that spanned 29 years and several locations: Grinnell, Ia., Washington Crossing, Pa., and Los Altos Hills, Ca. Bob and Joan retired to Kala Point in Port Townsend in 1986. In retirement, he enjoyed gourmet cooking, becoming a Master Gardener, and serving as president of the Kala Point Association for two years. He loved entertaining, reading, storytelling, and traveling. Bob will be remembered as a generous, kind man who was a loving husband, father, grandfather, great-grandfather and friend. Bob is survived by his beloved wife, Joan; his five children: Wayne (Cheryl) Fisher of Milton, De. ; Deb (Randy) Kalmbach of Winthrop, Wa. ; Stuart (Linda) Fisher of Bossier City, La. ; Scott Fisher of Mountainview, Ca. ; and Toby (Wendy) Fisher of Sunnyvale, Ca. ; nine grandchildren, one great-granddaughter; and his sister Martha Flynn of Sandwich, Ma. The family would like to thank the private caregivers, the staff of Dungeness Courte of Sequim, Wa., and Life Care Center of Port Townsend, Wa. for their compassionate care. A celebration of life is being planned. In lieu of flowers, donations can be made to the Jefferson Healthcare Hospice, 2500 W. Sims Way #300, Port Townsend, Wa. 98368. BOSCAWEN, NH - Died 24 December 2012, age 78, at Merrimack County Nursing Home, Boscawen, New Hampshire. Born in Boston, Ken grew up in Everett, Massachusetts. The son of the late Royden and Flora Fisher. He graduated Everett High School, Bentley College and Suffolk University. After school he joined the U.S Army serving during the Korean War. He worked in Accounting. He is survived by one sister Marie Tyler of Concord, NH, several nieces and nephews. He is predeceased by his brother, Allan Fisher. A memorial service will be held in the spring at the Veterans Cemetery in Boscawen, NH. SACKVILLE, NB - Born August 23, 1923 in St Patrick, Quebec. Died December 22, 2012 in Sackville, New Brunswick. Ned Fisher passed quietly and peacefully at home in the late afternoon of Saturday, December 22nd, sitting beside the Christmas tree having his afternoon tea. He was a huge fan of good dark fruit cake, soaked in his favorite Myers Dark Rum. His wife and life companion of 62 years, Valda (MacLeod) Fisher was at his side. They met during the wartime in England when he was in the Canadian Army and she was a Wren in the Royal Canadian Women's Naval Service. He is predeceased by his parents Evelyn Meredith Fisher and Donald Shives Fisher and his sister Ann (Fisher) Boulton of Montreal. Ned lived most of his life in Sackville, NB, attending the Mount Allison Academy for his early education. At the age of 12 he went off to Bishop's College School in Lennoxville, Quebec, following in the footsteps of his father and maternal grandfather. During WWII, Ned joined the Canadian Army. He first received basic training and advanced training as a private and then was recommended for officer training. Ned served as an officer in the Canadian Army both in Canada and the UK in the Armoured Corps. Later he converted to Infantry to serve as a Platoon Commander in the UK and Holland with the West Nova Scotia Regiment, participating in the Liberation of Holland. His children would coax him to tell them bedtime stories of his "adventures" from that time. His wartime service was always important and significant to him. After the war, he pursued his education at Sir George Williams and Mount Allison University. He then came into the family owned business "The Enterprise Foundry Company Limited" where he worked for more than thirty years, developing new products and a sales/distribution system that covered Canada from coast to coast. 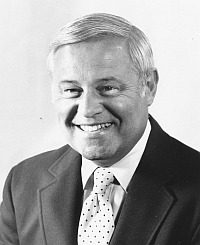 During the 1970's and early 80's, Ned was president of the company. In 1983, Ned and his son, Malcolm, formed a new company Compact Appliances. This has become a wholesale distributor throughout the Atlantic provinces of the latest types of supplementary heating products. The things he enjoyed most in life were working, his family, friends, travels to warm places and riding motorcycles. At age 85, when he was taken to the hospital after a serious motorcycle accident, the nurses nicknamed him "Evel Knievel". For years, summer holidays have been enjoyed at St. Patrick where 7 generations continue to gather with extended family and friends. The "old cottage" at Rayworth Beach has provided many an annual lobster feed to celebrate Ned's August 23rd birthday complete with numerous dogs, children and grandchildren. He was always easy to buy a gift for as he adored every imaginable maple product, anything from Lee Valley and books of history and intrigue. Ned Fisher was a contributing, engaged citizen and was known as an "old school gentleman". He was President of the local Children's Aid Society and a member of the Board of the Sackville Memorial Hospital, serving as president of that Board for several years. He was always a respected member of the Sackville Community. He helped form and build the Sackville Curling Club in the late 1940's. He served for a period of several years on the Endowment Fund Committee at Mount Allison University under President Bill Crawford. Nationally, he was an active member of industry organizations, serving as President of the Canadian Manufacturer's Association and as a Board member of Canada Cement Lafarge. He was a longtime member of the Sackville Branch of the Royal Canadian Legion, Branch #26. The family are grateful to Ned's care giving team of Pat Cormier, Ann Brooks and Doreen Beaton for their friendship and gifts of delicious "spare-rib" dinners, afternoon drives and discussions over the last seven months. The family most sincerely thanks, Dr. Allison Dysart for his care and attention. The Sackville Memorial Hospital nurses, staff and kitchen crew have all given above and beyond in so many ways to provide him with care and comfort. Ned is survived by his wife, Valda Fisher and three children: Meredith Fisher, Mollie Flemming (Jim) and Malcolm Fisher (Debbie). His grand children are Robin (John Buckler) and Ted Walker, Faith and Andrew Flemming, Abby, Max, Mari, Zack Fisher. Henry and Ned Buckler are his two great- grandchildren. He has one niece, Diana (Boulton) McNeill (Duncan) and her daughter, Kristin McNeill (Andy Churchill) of Montreal. Funeral arrangements are with Campbell's Funeral Home in Sackville, NB. There will be a visitation on Wednesday, Dec. 26th from 7-9 pm. The Funeral Service will take place on Thursday, Dec. 27th at St. Paul's Anglican Church at 11 am with the Revd. Canon Kevin Stockall officiating. In lieu of flowers, donations to the Sackville Memorial Hospital Foundation, The Lord Sackville IODE, Sackville Red Cross Society or the charity of your choice would be greatly appreciated. OTTAWA, ONTARIO - Died quietly in the Ottawa General Hospital of complications following pneumonia, on August 13th, 2011, aged 87. A long time resident of Sackville, New Brunswick, Jake was predeceased by his beloved wife of 55 years, Margery and their son, Alan. FORT PIERCE, FLORIDA - John Anthony Fontana, 78, died Oct. 29, 2009, at his home. He was born in New York City and lived in Fort Pierce since 1990, coming from Jackson, N.J. He served in the Marines during the Korean War. Before retirement, he worked as a butcher for Shop Rite Superama in Lakewood, N.J., for 38 years. He was a member of the Crossing Community Church in Fort Pierce. He was a member of the Lions Club, Moose lodge and Italian American Club in Jackson. Survivors include his wife of 58 years, Lois Fontana of Fort Pierce; son, John Fontana of Jackson; daughters, Jodi Mycz of Beachwood, N.J., and Laurie Fontana of Toms River, N.J.; sister, Rosalie Johnson of Sun City West; Ariz; 11 grandchildren; and one great-grandchild. He was preceded in death by a daughter, Karen O'Connell; and brother, Charles Fontana. Memorial contributions may be made to the Hospice Foundation c/o Treasure Coast Hospice, 1201 S.E. Indian St., Stuart, FL 34997. Services: A memorial service will be at 11 a.m. Nov. 3 at the Crossing Community Church in Fort Pierce. Arrangements are by Cox-Gifford-Seawinds Funeral Home and Crematory, Vero Beach. A guest book may be signed at seawindsfh.com/obit.php. GLEN AUBREY, N.Y. — Diane Katherine Blessing, 55, of Glen Aubrey, formerly of Sparta, passed away after a long illness on Saturday, March 1, 2008, at Vestal Nursing Center in New York. She was born in Franklin to Dorothy Zoe Ralph Blessing and Dr. Joseph M. Blessing Jr. Ms. Blessing was a graduate of Sparta High School, Class of 1971, and a graduate of Bloomsburg State College in 1975, where she earned her bachelor of science degree in education. Ms. Blessing was best known for her love of children and cooking. She was predeceased by her dear father, Dr. Joseph M. Blessing Jr., in 1964 and her loving companion, Roger Harrington, in 2002. Ms. Blessing leaves behind her loving mother, Dorothy Zoe Randolph, and her stepfather, Donald Randolph; her two brothers, Joseph Blessing of Ogdensburg and Karl Blessing and his wife, Deborah, of Ohio; her nephew, Paul Blessing, and two nieces, Allyson and Anna Blessing, all of Ohio. Ms. Blessing also leaves behind her two stepsisters, Janice Berndt and Diane Reece, and her dear cousin, Phyllis Blessing. Friends may call on Tuesday from 7 to 9 p.m. at Goble Funeral Home, 22 Main St., Sparta. A funeral service will be held on Wednesday at 12 noon at the Sparta United Methodist Church, 71 Sparta Ave., Sparta. Interment will follow at Sparta Cemetery. In lieu of flowers, donations may be made to the American Cancer Society, Memorial Processing Center, P.O. Box 7, East Syracuse, NY 13057 or to Danielle House, 160 Riverside Dr., Binghamton, NY 13905. PORT ST. LUCIE, FLORIDA - Karen O'Connell, 54, of Port St. Lucie, passed away October 12, 2007 at St. Lucie Medical Center. She was born February 25, 1953 in Camp Lejeune, NC. She had been a resident of Port St. Lucie for 20 years, moving from Bricktown, NJ. She had been a Paraprofessional for 14 years at St. Lucie West Middle School. Karen was very involved with all of the students at school, including bowling and golf tournaments for the school. She received Employee of the Month, and the ESE Award from the school. Karen loved gardening and was the "Bunco Queen". Karen was a wonderful mother, a wonderful wife, and a best friend. Her son Jason said that she was his best friend and his guiding light through everything in his life. Karen was her daughter Tracy's best friend and role model, "If it wasn't for her, I wouldn't have learned about all the finer things in life." She is survived by her husband of 30 years, Jerry O'Connell of Port St. Lucie; son, Jason O'Connell of Port St. Lucie; daughter, Tracy O'Connell of Port St. Lucie; parents, Lois and John Fontana of Ft. Pierce; Sisters, Jodi Mycz (Steve) of Beachwood, NJ, Laurie Fontana of Toms River, NJ; brother, John Fontana Jr. (Donna) of Jackson, NJ; and granddogs, Mercedez, Snykers and Jake. Visitation will be 2:00 – 4:00 PM and 6:00 – 8:00 PM, Monday, October 15th, and 2:00 – 4:00 PM and 7 – 9:00 PM, Tuesday, October 16th, at Byrd Young & Prill Port St. Lucie Funeral Home. Funeral Service will be 10:00 AM, Wednesday, at Byrd Young & Prill Port St. Lucie Funeral Home, with Rev. Craig Bridges officiating. Entombment will follow in Rolling Oaks Cemetery, Port St. Lucie. An online registry is available to sign and leave notes of condolence at the web site of Byrd, Young, and Prill. She was a great-granddaughter of Charles Frederick Fisher and Sarah Young of Middleton, Nova Scotia, through their daughter Dorothy Josephine Ralph. AUGUSTA, GEORGIA - Dr. Robert Gordon Ellison Sr., a stalwart of the Medical College of Georgia who helped revolutionize the field of cardiothoracic surgery, died Jan. 8 at age 89 at MCG. "Dr. Ellison's contributions as a member of the MCG faculty are incalculable," said MCG President Daniel W. Rahn. "He was directly responsible for many of MCG's most groundbreaking achievements, and he simply helped change the face of health care. He will be sorely missed." The funeral will be held Thursday, Jan. 12 at 11 a.m. at Augusta's Trinity on the Hill United Methodist Church, 1330 Monte Sano Ave., followed by burial at Westover Memorial Park, 2601 Wheeler Road. The family will receive visitors Wednesday, Jan. 11 from 6-8 p.m. at Elliott and Sons Funeral Home, 1134 Telfair St.
Dr. Ellison, the son of John Gordon Ellison and Fredricka Fisher Ellison, was a native of Millen, Ga. He earned a bachelor's degree in biology and chemistry from Vanderbilt University in 1939 and a medical degree from MCG in 1943. After completing an internship and residency at University Hospital and MCG and a cardiopulmonary physiology fellowship at Bellevue Hospital of Columbia University College of Physicians and Surgeons in New York, he joined the MCG faculty in 1947 as an instructor and became professor of thoracic surgery and chief of the Section of Thoracic and Cardiac Surgery in 1959. He was named Leon Henri Charbonnier Professor of Surgery in 1973. He retired from MCG in 1987 as Charbonnier Professor of Surgery Emeritus and Chief of the Section of Thoracic and Cardiac Surgery Emeritus. He was chief of general thoracic surgery at the Veterans Affairs Medical Center in Augusta from 1987-1991. He contributed extensively to MCG's teaching, research and educational missions and performed Georgia's first open-heart operation in 1956. He worked closely with his wife, Dr. Lois Taylor Ellison, whom he married in 1945 and who helped develop MCG's cardiopulmonary laboratory for cardiac catheterizations and pulmonary function studies. His research contributions in the cardiothoracic surgery field included improved modified techniques for cardiothoracic surgery, investigation of pacemakers, long-term evaluation of mechanical versus tissue prosthesis, evaluation of methods of myocardial preservation during open heart surgery, long term results of surgery for coronary artery disease and transplantation of the heart and lung. Dr. Ellison was a past president of the Augusta Area Tuberculosis Association, the Georgia Heart Association, the Georgia Surgical Society, the Georgia Thoracic Society, the Georgia Tuberculosis Association, the Southern Thoracic Surgical Association and the Society of Thoracic Surgeons. He chaired the American Board of Thoracic Surgery from 1979-81. He was a fellow of the American College of Cardiology, the American College of Chest Physicians, the American College of Surgeons and the Southeastern Surgical Congress. He was a member of the Alpha Omega Honor Society and Sigma Xi. His many awards included a School of Medicine Distinguished Alumnus Award, School of Medicine Distinguished Faculty Award for Institutional Service, School of Medicine Recognition and Appreciation Award, American Heart Association Heart of Gold Award, Society of Thoracic Surgeons Silver Platter, Richmond County Medical Society Achievement Award, Medical Association of Georgia Hardman Cup, 2005 Lifetime Achievement Award from the Georgia Chapter of the American College of Cardiology and MCG's 2005 Vessel of Life Award, presented to Dr. Ellison and his wife. The Robert G. Ellison, M.D. Symposium on Thoracic Surgery was established in his honor. He published 133 articles in medical journals, was co-editor of one book, author of one book and contributed chapters to 11 books. He was a member of Trinity on the Hill United Methodist Church and the Damren Sunday School Class, the Kiwanis Club and the Augusta Country Club. Dr. Ellison's survivors include his wife, Dr. Lois Taylor Ellison; five sons, Dr. Robert G. Ellison Jr. and wife Penny of Jacksonville, Fla., Dr. Gregory T. Ellison and wife Marty of Augusta, Dr. Mark F. Ellison and wife Betsy of Athens, James W. Ellison of Augusta and John C. Ellison and wife Jackie of Atlanta; grandchildren Robert G. Ellison III, Lauren Ellison, Taylor Ellison Jr., Leigh Ellison, Sarah Ellison, Mark Ellison Jr., David Ellison, John Ellison Jr. and Jerry Ellison; and brother Fred F. Ellison of Durham, N.C. In lieu of flowers, contributions may be made to the Robert G. Ellison, M.D., Chair of Cardiothoracic Surgery at MCG, MCG Foundation, Inc., 919 15th St. Alumni Center, Augusta, Ga., 30912 or the Television Ministries of Trinity on the Hill United Methodist Church, 1330 Monte Sano Ave., Augusta, Ga. 30904. Margery Ross Campbell Fisher passed away unexpected on June 7, 2005 at the age of 80. Survived by her husband, Maurice (Jake) of 55 years; and her children, Judith (Keith Purchase), Michael (Karen Phinney), Susan and Ian (Judith Cane). Predeceased by her son, Alan. Margery will also be greatly missed by her sister, Heather Seybold; her brother, Davidson Campbell; and her long-awaited, greatly beloved grandsons, Samuel, Colin and Sam. Margery was a graduate of the Royal Victoria College of Nursing in Montreal and Mount Allison University in Sackville, and was one of the original "stews" at TCA. Visitation at Campbell's Funeral Home, Sackville, N.B., Friday, June 10, 2 to 4 and 7 to 9 p.m. Funeral Service will be held at St. Paul's Anglican Church, 125 Main Street, Sackville, on Saturday, June 11, 2005 at 11:00 a.m. Reception to follow. Flowers are welcome or donations to the VON or Red Cross. SACKVILLE, NB - Frederick William (Bill) Fisher, passed away peacefully at the Sackville Memorial Hospital, on Sunday, April 10, 2005 at the age of 95. Born in Sackville, NB on January 22, 1910, he was the son of the late Frederick Arnold Fisher and Nora (Wiggins) Fisher. Bill was educated in Sackville and at Rothesay Collegiate School and served in the Canadian Armed Forces during WWII. He was employed in a management position with Enterprise Foundry Company Ltd. until his retirement. Bill was a member of the Kinsmen Club, longtime member of the Sackville Rotary Club and the Sackville Curling Club. He will be sadly missed by his sister Nora Tapley of Sackville, NB; his brother, George (Norma) Fisher of Kemptville, Ontario; a stepdaughter and several nieces and nephews. He was predeceased by his first wife Marjorie (Belding) Fisher and his second wife, Sally (Conner) Fisher; his brother, John W. Fisher and his sister Katherine S. (Fisher) Tamplet. Arrangements are entrusted to Campbell's Funeral Home, 89 Bridge Street, Sackville, NB (364-8188). Cremation has taken place and a memorial service will be held on a date to be announced. Donations in memory of Bill may be made to the Sackville Memorial Hospital Foundation, St. Paul's Anglican Church or to the charity of one's choice. SACKVILLE, NB - It is with great sadness that Marg, Brian and Janet Tingley, wife and children, announce the death of their husband and father, Arthur Vincent Tingley on Thursday, November 4, 2004. Born in Sackville, N.B. on July 2, 1928, he was the son of the late Harry A. and Ida (Hicks) Tingley. Art is survived by his wife of thirty six years, Margaret (Tapley) Tingley of Sackville, N.B. ; son, Brian Tingley; and daughter, Janet Tingley, both of Moncton, N.B. ; brother, Harry Jr. (Evelyn) Tingley of Creston, BC; four sisters, Edith Fairweather of Moncton, N.B., Audrey (Adelard) Cormier of Moncton, N.B., Martha (George) Stultz of Crossfield, AB and Marilyn Myra of Sussex, N.B. ; two grandchildren, Virginia and Alexander Tingley of Dorchester, N.B. ; and several nieces and nephews. He was predeceased by his parents, Harry and Ida; sister, Ruth; two brothers, Herman and Don; and two infant sons. Arrangements are entrusted to Campbell's Funeral Home, 89 Bridge Street, Sackville, N.B. (364-8188). Cremation has taken place. Visitation will take place on Monday, November 8, 2004 from 2 to 4 and 7 to 9 PM from Campbell's Funeral Home. The Funeral Service will be held from St. Paul's Anglican Church on Tuesday, November 9, 2004 at 4 PM with Father Kevin Stockall officiating. Burial will follow in The Sackville Cemetery. Following the burial a reception will be held at Campbell's Funeral Home, Sackville, N.B. In lieu of flowers, donations in Art's memory may be made to the Sackville Memorial Hospital, Parkinson's Society, Canadian Diabetic Association or to the charity of ones choice. COMOX, BC - Dorothy Mae Grant, aged 90 of Comox, BC, passed away peacefully at St. Joseph's Hospital on Thursday, December 5, 2002. Predeceased by her husband Kenneth and sister Edith. She is survived and will be dearly missed by her daughters, Joyce (Gray) Pearson of Nanaimo, BC, Vivian (Gerald) Bethell of Ontario and Terry (Bill) Fisher of Comox; her grandchildren, great grandchildren and half-sister Shirley. Dorothy was a resident of Fredericton, for many years, moving to Comox in 1998 to be with her family. She will be sadly missed as well by her many friends at Bay Community Church. Following cremation, interment will take place in New Brunswick at a later date. Comox Valley Funeral Home, 1101 Ryan Road, Courtenay, BC entrusted with arrangements. For those wishing, donations in her memory to the Heart and Stroke Foundation, or the Canadian Cancer Society would be appreciated.